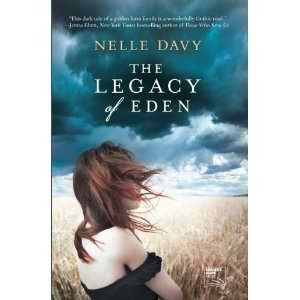 The Legacy of Eden is Nelle Davy's debut novel, featuring the legacy of an estate named Aurelia - a farm in Iowa. The novel opens in present-day New York, when Meredith Pincetti receives a letter about the settlement of the Aurelia farm, previously managed by her recently deceased cousin, Cal Hathaway, Jr. Meredith then contacts her sisters regarding the settlement of the estate, and leaves New York to revisit the Iowa farm and gather some of her family's belongings before they are sold. Although readers are under the impression that Meredith's return to Aurelia is highly stressful and upsetting, we do not learn fully why this is so until the end of the novel. The Legacy of Eden spans between past and present, regaling readers on the history of the farm dating back to the 1940s, when Meredith's grandmother Lavinia marries into the Hathaway family. As the years pass, Lavinia strives to maintain her family's honorable reputation in their Iowa town by means of lies and manipulation, even banning a few family members from Aurelia forever in the process. The novel finally concludes when we learn why Meredith has always had terrible memories about Aurelia and her family. Although the novel is pure fiction, I felt that The Legacy of Eden read like any other historical tale of a family farm and estate in Iowa, which didn't quite make it memorable or unique. Common problems arise; such as financial difficulties, affairs, lies, and deceit, although none of these factors are made to be very titillating, shocking, or remotely exciting in this particular novel. The author writes beautifully, using excellent prose and word-choice, but the novel lacks depth and originality. As seems to be an ongoing theme and cliche with "farm" and "legacy" novels, the apex involves family scandal - the details of which I won't reveal here for the sake of spoilers. If you have already read this novel, you will know exactly the type of family scandal to which I am referring. Yep, that one. Those who enjoy reading about family legacies may not exactly have a great experience with The Legacy of Eden, especially since no one character is intriguing enough to invoke emotion or feeling in the reader. If you did enjoy The Legacy of Eden, you may also like some earlier works by V.C. Andrews, such as the Heaven Casteel series, the Ruby Landry series, and the Dawn Cutler series. I felt that these novels were definitely very similar. What are your favorite novels about legacies? Click on the images of the books below to view them in more detail on Amazon.com.